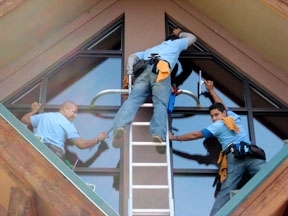 Residential Window Cleaning, Commercial Window Cleaning, High Work, Roof Snow Removal, HOAs, High Rises, Etc..
New Construction, Remodels, Move-out & Move-in Cleanings, Glass Cleaning Demolition Labor, etc. Janitorial Services for Offices, Shops, Medical Facilities, Commercial Buildings, HOAs and Residential Common areas, etc. Whatever cleaning services your Summit County home needs, from Breckenridge window cleaning, glass cleaning in Frisco and roof snow removal to janitorial services in Dillon and Vail construction cleaning we are your point of reference... & our clients are happy to tell you about it! Customer Service and Going the Extra Mile are our First Priorities! "As a high-end luxury home builder, we are driven to perfection in everything we do, and we use Perfect Service for all of our construction cleaning. With great customer service, reliability, and excellent cleaning and window washing capabilities, I completely trust Perfect Service for all our projects – interior as well as windows!" Copyright © 2011 Perfect Service Cleaning Contractors LLC.